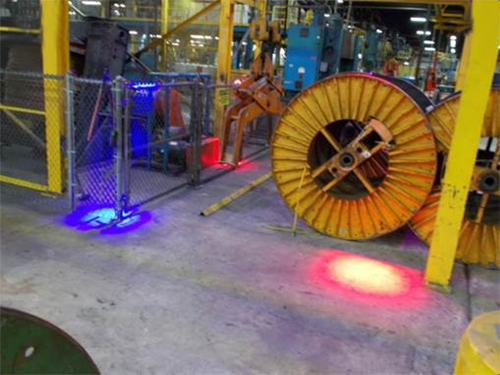 Project lines or dots of light from an overhead lift onto the floor to help prevent worker injuries caused by crane hooks and suspended loads. 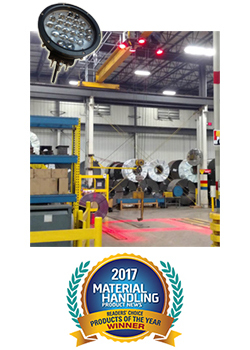 Each light features 24 LEDs that shine a bright beam onto the floor to warn that a hook from an overhead crane is in the area. Overhead warning lights also make positioning the crane hook and moving objects easier for crane operators, who can use the light as a point of reference for their hook position. Install the lens cover to switch the light beam from a dot to a line. Mounting brackets are adjustable so placement of the warning light is simple and easy. This single overhead warning light projects one dot or line. Picture shows four warning lights.